Early in my graduate career I received the advice to be like a duck–remain serene on the surface all the while paddling like hell underneath. Serenity has never been a strong point of mine, so I’ve come up with a compromise: swim like an otter–dive underwater, paddle like hell, then come crashing to the surface in a completely different place, lolling on your back like you don’t have a care in the world. I’m hoping that the relative quiet here on this blog feels like that to you, dear reader. We have 34 backers and are just shy of our half-way point at $2,257.00 out of $5,000.00. We may be getting matching funds, so it’s really important that we make that $5,000 mark–we don’t get any money if we don’t raise it all. If I missed anyone, please let me know! Our fundraising drive ends on July 15th. If you can’t spare a dollar, spare a link? Crowdsourcing Archaeology – The Maeander Project Kickstarter Page! After months of waiting, we received very short notice that we had indeed received a permit to conduct an archaeological survey in southwestern Turkey. Sadly we did not receive all of the funding that we had hoped–it is difficult to fund a project before you have a permit, and to get a permit before you fund a project. The fledgling project had taken flight, the Maeander Project is a go. While $5000 does not cover all of our costs, it would help a great deal. Also, if we are unable to raise this amount of money in a month, we do not receive ANY of it! So please, if you can, throw a couple of dollars our way. If you can’t (and I completely understand!) then please help us by getting the word out about this project. Author colleenmorganPosted on June 16, 2011 Categories anthropology, Archaeology, new media, outreachTags Archaeology, maeander6 Comments on Crowdsourcing Archaeology – The Maeander Project Kickstarter Page! I just finished up a 10-day road trip, driving from my folks’ house in northern Colorado back to California, with some fairly significant detours along the way. After taking a quick soak in Glenwood Springs, we took the Million Dollar highway down to Mesa Verde. Colorado had a long, wet winter this year and it paid off in a spectacular run-off, accompanied by the greenest, most wildflower-filled spring I’d ever seen. I have to admit, I was beyond excited to go to Mesa Verde. Though I’d lived in Colorado for a while, I never made it down to the four-corners region to check out the gorgeous vistas and the Ancestral Puebloan ruins that cover the landscape. It was pretty much a perfect storm of Colleen-geekery: ancient architecture, cave-dwellers, and the National Park system. The National Parks are a revered institution in the US – I’d argue that they constitute a cornerstone of American national identity. As a large, government institution I’m sure there are widely divergent experiences within the National Park service that would either support my enthusiasm or shatter it completely, but as an outside beneficiary of the decades of hard work by thousands of park staff, I remain a big fan. While others have written more cogently on the aesthetics and the motives of the National Park, Mesa Verde struck me as one of the most vivid examples of the managed tourism and “National Park rustic” or Parkitecture that the National Parks has to offer. Parkitecture attempts to blend in with the natural environment and is often a folksy mix of wood, stone, and hidden cinderblock architecture. 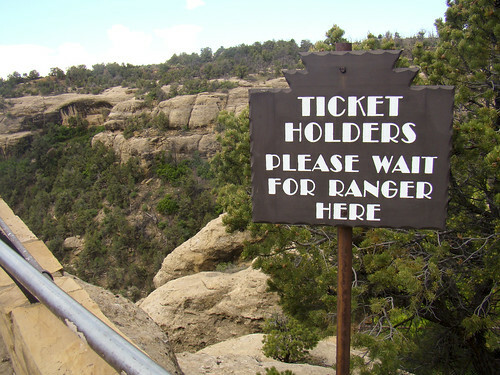 While the facilities at Mesa Verde are not as iconic as those at the Grand Canyon or Yellowstone, the log ladders, stone borders, and wooden cautionary signs contributed to the “parkiness” of the park, signifiers of the managed nature of the park. While Parkitecture has its design roots in the 1920s, Franklin Delano Roosevelt’s New Deal projects in the 1930s provided the labor force necessary for transforming the National Parks into tourist destinations. The Civilian Conservation Corps (CCC) were young men between the ages of 18-25 who enrolled in a six-month term and were paid $5 – $8 a month while $22-$25 a month was sent back to their families. The “CCC boys” camped at Mesa Verde during the duration and their work can be seen in most aspects of the park’s development. (I’ll be mentioning the CCC again in the next Mesa Verde post, but for more information, check out the excellent New Deal Days: The CCC at Mesa Verde.) Without the New Deal investment in the improvement of the parks, it is doubtful that they would have risen to such prominence in the national imagination. Parkitecture occupies an interesting liminal space in the parks; it both informs and restricts your movement, trying to blend in with the natural surroundings while being obviously official. It also requires an investment in apparently outdated trades–we saw trail maintenance in Zion being performed by a team of masons with chisels and hammers, chipping the red sandstone into appropriately rustic blocks. The curation and preservation of these trade skills seem just as important to me as the park itself. In the extreme, parkitecture can contribute to the Disneyesque feel of the parks. One of the trail loops at Mesa Verde is only accessible by what they call a tram, what is, in practice, a bit more like a stretch golf-cart. We sat in the tram and there was a pre-recorded interpretive speech that blared as we zoomed by the different “attractions.” Even as Americans have gotten fatter, our hunger for National Parks remains unabated, with attendance rising each year. The best beloved and most visited parks have had to adopt measures such as this tram and an increased control over exploration of the monuments, to protect the park’s resources while still catering to the widest possible constituency. While the paved walkways and carefully groomed garden-fences allow people of most physical abilities to experience the parks, it can be frustrating to those of us who are used to scrambling up cliffs, through waterfalls and into the ruins. $14.6 million dollars went to Mesa Verde for six projects, from improving water lines to the purchase of alternative fuel transit buses for tours of the park. The full list of Recovery Projects slated for the National Parks is actually very interesting and a little sad, considering that the majority of work is very basic, long-needed repairs. This funding seems at best a fairly scanty gesture, especially compared to the massive investment that the New Deal projects provided for our parks and for the enskilment of a generation of workers.